A leading UN climate scientist predicts Earth will experience a period of cooling for the next three decades, according to a recent FoxNews.com article. Items in New Scientist and the UK's Daily Mail repeat the same news, and each of them cites the same source: Mojib Latif, a professor at Germany's Kiel University and a contributor to the 2007 climate assessment report published by the UN's Intergovernmental Panel on Climate Change (IPCC). Latif reported at the UN's World Climate Conference in Geneva last year that cyclical changes in the Atlantic and Pacific Oceans have likely contributed to the past three decades' rise in global temperatures and will probably mean cooler temperatures globally for some time. He based his report on research he and four colleagues published in the journal Naturein 2008. But Latif is quick to point out this does not mean global warming is quenched. On the contrary, he emphasized a long-term warming trend "driven by the evolution of greenhouse gases" in an interview with Climate Progress. Far from denying man-made global warming, Latif said his research suggested the oceanic cycles could temporarily offset the expected global surface temperature rise caused by human activities. He also admitted, "We don't trust our forecast beyond 2015." In other words, Latif is absolutely certain of long-term global warming but can only ensure his cooling forecast for about six or seven years. Other scientists are more certain of long-term global cooling. Professors Kyle Swanson and Anastasios Tsonis with the University of Wisconsin-Milwaukee published a peer-reviewed paper last year in the highly respected journal Geophysical Research Letters called "Has the Climate Recently Shifted?" It revealed atmospheric and oceanic cycles as "harbingers" of climate change. In an interview with Carbon Purging, Tsonis explained his research suggested natural variability plays a larger role in determining climate than any of mankind's contributions. Tsonis believes anthropogenic (man-made) global warming (AGW) could exacerbate the effect of these natural variables, and he acknowledges greenhouse gases produced by humans contribute to average global temperature. However, "it appears that the [average] global temperature has at least leveled off if not decreas[ed]," Tsonis added. "Right now, we would say that the rapid warming in the 80s and 90s has stopped and we are entering a cooler regime." 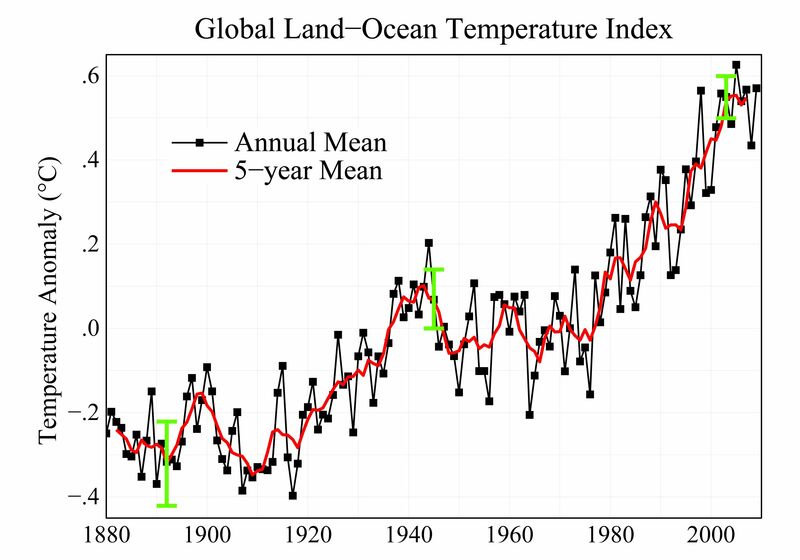 The interviewer challenged this claim citing data from NASA that reported a 0.16o C rise from 2001 to 2007. Tsonis called this a practical "leveling-off" and said, "There are other records around that show cooling." I do not believe in catastrophe theories. Man-made warming is balanced by the natural cycles, and I do not trust the computer models which state that if CO2 reaches a particular level then temperatures and sea levels will rise by a given amount. These models cannot be trusted to predict the weather for a week, yet they are running them to give readings for 100 years. It should come as no surprise, however, that NASA reported last week Earth has just experienced the warmest decade on record. It charted a pronounced upward trend in global temperatures since record keeping began in 1880. NASA attributes much of the rise to greenhouse gases but does not explain how late 19th and early 20th century human activity could have contributed enough to cause the reported rise during that time period. NASA also says oceanic and solar cycles as well as volcanic activity are other factors influencing global temperatures. Interestingly, the NASA graph does not produce the infamous "hockey stick" shape fallaciously concocted by a Climategate researcher to illustrate a drastic rise in temperatures in recent years. It is cited as valid in IPCC climate reports and is featured in Al Gore's docu-drama An Inconvenient Truth, but the "hockey stick" was condemned as a hoax in a 2006 congressional investigation.